Tegan and Sara and The Lonely Island have been confirmed to perform their Oscar-nominated song from The Lego Movie, "Everything Is Awesome" at the 87th Oscars. 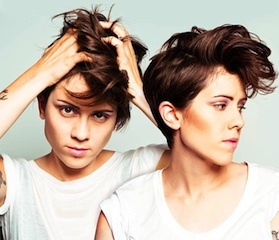 "Tegan and Sara and Lonely Island?.....Everything Is Awesome, indeed. This is certainly an 'Only on the Oscars' moment," said show producers Zadan and Meron when announcing the news earlier today. The 87th Oscars will be held on Sunday, February 22, 2015, at the Dolby Theatre® at Hollywood & Highland Center® in Hollywood, and will be televised live on the ABC Television Network at 7 p.m. ET/4 p.m. PT. The Oscars, produced by Zadan and Meron, also will be televised live in more than 225 countries and territories worldwide.